Fara Williams says it will be a proud moment if she becomes the first player to reach 150 England caps against Germany on Sunday. England, who lost their opening game of the SheBelieves Cup against USA, take on the European champions in Tennessee. "I don't think anyone would ever think they would achieve something like this," Williams, 32, told BBC Sport. "It's a proud moment if it comes, for both me and my family. It's going to be massive." Arsenal midfielder Williams, who is England's most capped player, says she wants to prolong her international future for as long as possible, but predicts her record will be broken in the future. "I'll keep working hard, keep myself fit, keep competitive and if I do that then I know I can always give something," said Williams, who made her debut as a 17-year-old against Portugal in 2001. 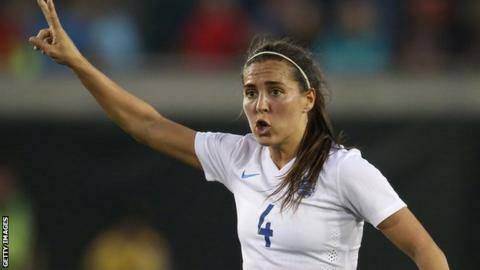 "Every game that I play, I feel really lucky to represent England. I never come here thinking I'm going to play and that keeps me motivated. "I definitely think a women's player will reach my record in a few years, maybe after I've retired they'll be up there. "Jill Scott has got a lot of years left in her, Karen Carney's got a lot of caps behind her and I thought Alex Scott would have stayed near but she's now got Lucy Bronze playing well too." Striker Eniola Aluko could also make her 100th appearance for England in Sunday's match against Germany. England's victory against Germany at last summer's World Cup, which sealed a bronze medal, was their only victory over them in 31 years. Williams says that result, as well as a goalless draw against Germany in November, has given the Lionesses plenty of confidence ahead of Sunday's clash. "I definitely think we'll get a result and it's going to be a win," Williams said. "Once we lost that America match, we regrouped because there were lots of positives to take from the game. You'll see another energised performance against Germany. "That decision making in the final third, that cutting edge is what will change the game for us." England's final group game is against France in Boca Raton on 9 March.